A vintage brew, that used to be aged 3 years before being released, which has been discontinued since the brewery was taken over by Carlsberg. Used to come in a pitch black opaque bottle, and an opener with the year of the vintage was included. The last vintage was brewed in 1996. UPDATED: JAN 19, 2019 Bottle shared by Peter Högström thanks. Bottle from 1996. Sampled 2019. Nice grey head. Clear dark red brown color. Old tired malty aroma with a touch of black currants. Old malt taste with a dark fruit. Medium body and bitterness. Appearance: Black colour with no head. Body: Medium body, low carbonation. Flavour: Mild malt, vinous, caramel. Bottled (1994 vintage). Quite much very dasrk ambery brown (close to black colour), small off-white. Aroma is toffee, mild madeiraoxidation, some mild chocolate as well as some mild smoked notes. Flavour is mild smoked notes, chocolate, some mild madeirawinelike notes as well as some dark fruits. Quite lovely. Thanks Raipe! Aroma of raisins, mämmi, sherry. Medium-bodied. Aged very well. Mämmi, raisins, licorice, dark malts in the flavor. Portwineous. Of course now quite watery, but aged well! aroma is quite strong, but i have a har dtime figuring what it is. probably due to aging. flavor is mostly caramel, dark fruits, nice hops, sugar. palate is a little too watery overall interesting and quite tasty. (Bottle from 1989) Pours dark brown. The aroma is “old” smelling with port/vinous tones of brown sugar, raisins, soy and dark bread. A smooth roast profile of dark chocolate is also present. The flavour is of chocolate, mild coffee, dark fruits, dark berries and some milky tones. The mouthfeel is watery but surprisingly clean. Lingering aftertaste of dark bread and coffee. Light bodied. 1996 vintage complete with its bottle opener courtesy of omhper. Pours a dark brown with almost no carbonation to speak of. Only a handful of sparse white bubbles dot the glass. Smells of dark fruit, caramel, some roasted malt lots of oaky hints. Tastes of dark fruit, completely flat carbonation wise with only some tingly hints on the tongue which is no surprise on a 12 year old bottle, lots of sweet malt, some cherries. This is a 5.5% beer that is 12 years old? Impressive! Bottled. Vintage 1989. Dark, muddy brown. Small, bubbly head. Slightly vinous aroma from sweet fruits; raisins, prune. A bit thin body with almost no carbonation. Raisins and chocolate in the flavour, and some burnt sugar. 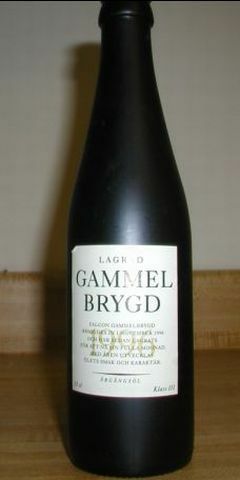 Bottle (33 cl) at a Göteborg RB tasting, vintage 1989. Dark brown, low head. Dark sugar and Madeira, dried fruits. Low carbonation, low bitterness,a bit too sweet.